© Abanador-Kamper et al. ; Licensee Bentham Open. Appropriate use of sedatives and analgesics is essential to keep critically ill patients comfortable and to prevent prolonged mechanical ventilation time and length of stay in ICU. Aim of this study was to analyse the long-term effect of an algorithm-based individual analgesic-sedative protocol on mechanical ventilation time and ICU length of stay in critically ill patients after sudden cardiac arrest due to ST-elevated myocardial infarction. We examined a total of 109 patients before and after implementation of an algorithm-based sedation management. Our sedation protocol included individual defined sedation goals achieved by standardized sedation strategies. Mechanical ventilation time and ICU length of stay were analysed for three groups of patients: before and after the intervention and in the long-term follow-up. 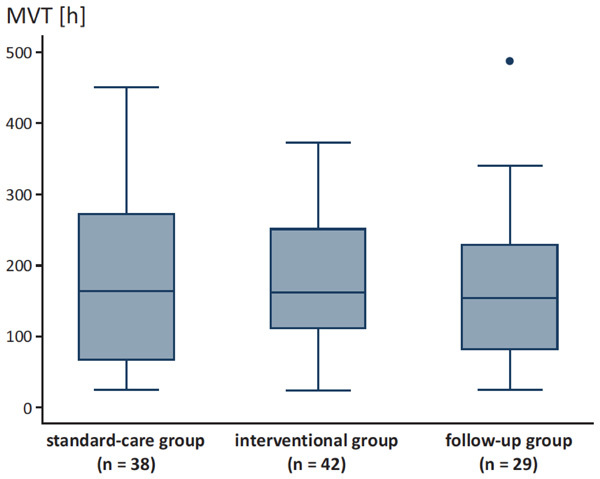 We observed shorter median mechanical ventilation time and ICU length of stay in the interventional and longterm follow-up group compared to the standard-care group without statistical significance. Our results demonstrate a long-term reduction of mechanical ventilation time and ICU length of stay achieved by implementation of an individual sedation management. This suggests sedation guidelines as effective tools to reduce the mechanical ventilation time and ICU length of stay in patients after sudden cardiac arrest in ST-elevated myocardial infarction. Investigations with a larger patient number and higher statistical power are required to confirm these findings. Keywords: Sedation protocol, long-term effect, guideline, mechanical ventilation. Several studies have proven the effectiveness of optimized sedative and pain management in critically ill patients [1-3]. Sedation and analgesia is essential in critical care therapy to keep critically ill patients comfortable. However, excessive sedation results in prolonged mechanical ventilation time (MVT) and length of stay (LOS) in ICU with the risk of concomitant complications. A protocol-based sedation and analgesia guideline with a clear definition of a sedation level goal is a potential solution to these difficulties in clinical practise . The use of sedation and pain scales is therefore essential for adequate monitoring. Many clinical assessment tools, as well as neurophysiological monitors have beenshown to be useful in the reduction of analgo-sedative medication . Despite of these data, standardized sedation guidelines including adequate monitoring are not implemented in the majority of ICUs, so far [3, 6, 7]. A German consensus-based guideline was published in 2010 demonstrating the improved used of protocol-based approaches in German ICUs . Patients surviving sudden cardiac arrest in ST-elevated myocardial infarction (STEMI) have been shown to have poor prognosis [8, 9]. Standardized sedation guidelines in this specific collective are not frequently available and the long-term influence of continuous quality and process improvement in analgesia and sedation on cardiological critically ill patients has not been sufficiently evaluated, so far. The purpose of this follow-up study was to analyse the long-term effect of an algorithm-based individual analgesic-sedative protocol before and after implementation on MVT and LOS in critically ill patients after sudden cardiac arrest in STEMI. We included 109 patients with a positive outcome after sudden cardiac arrest on the basis of STEMI if successful extubation after critical care therapy was accomplished. Patients with endotracheal intubation and MVT over 24h were included. Patients were eligible if they had ST-segment elevation of at least 0.1 mV in ≥ 2 extremity leads or at least 0.2 mV in ≥ 2 precordial leads. Resuscitations were mostly out-of-hospital with reported resuscitation periods between 1 and 15 minutes. Due to the underlying diagnosis of STEMI primary PCI was performed. Some of these patients were resuscitated during PCI due to peri-interventional arrhythmias (e.g. ventricular fibrillation). Whenever feasible mild therapeutic hypothermia using endovascular cooling was performed due to recent guidelines for cardiopulmonary resuscitation . Clinical data were obtained from our IT system. We excluded patients without STEMI, patients with neurological impairment validated by diagnostic examinations including EEG, evoked potential and/or cerebral imaging. Patients with a necessity for percutaneous tracheotomy, due to failure of successful extubation (e.g. severe COLD, ARDS), patients with lethal exit and patients that were transferred from external ICUs to our unit were also excluded from the study to prevent possible interaction with external sedation practises. Data for patients with self-extubations and reintubations were not subjected to statistical testing. This study was designed as a mono-centric study in an adult cardiac ICU of a German university hospital heart centre. 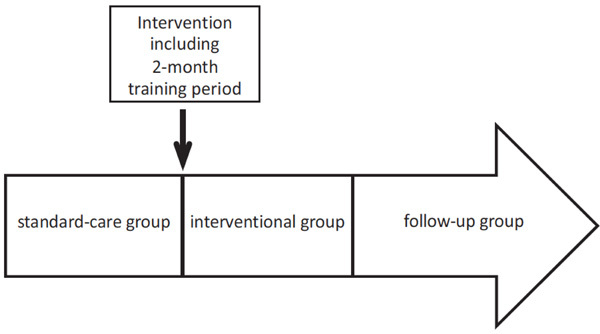 We compared a standard-care group (n= 38) to an interventional group (n= 42) and a follow-up group (n=29) up to 29 months after implementation of an algorithm-based sedation guideline. The standard-care group sustained sedatives and analgesia conform to S2-guidelines, whereby neither explicit sedation algorithm nor sedation monitoring was used. Standardized protocols in the process of weaning from mechanical ventilation, monitoring of depth of sedation and use of pain scales were not usual practise before implementation of the standardized sedation management and therefore not practised in the standard-care group. Standard-care data acquisition was collected for 12 months between April 2007 and April 2008. The intervention was implemented in May 2008 followed by a 2-months training period to ascertain confident performance of each staff member (Fig. 1). We developed and introduced an algorithm-based sedation protocol according to recent guidelines and the study by Brook et al. . Data collection of the interventional group was acquired for 18 months from July 2008 until December 2009. Data acquisition of the follow-up group was surveyed for 11 months between January 2010 and November 2010. Data acquisition and timeline of the study. MVT for the different groups. LOS for the different groups. Demographic data of the study collective. Specialised medical staff including doctors and registered nurses exclusively works in the ICU in 24-h attendance. A total of 6 intensive care medical officers were allocated to the unit for 7 days in rotation for a minimum of 6 months. The registered nurse to patient ratio was 1:2 for mechanically ventilated patients. Analgo-sedative drugs (sufentanil and midazolam), basic critical care practises, mechanical ventilation and weaning did not change during the study. Supplementary medication was not changed during the study and was applied conform to actual S2-guidelines of the German society of anaesthesiology and intensive care medicine for sedatives and analgesics in critical care therapy . Additional drugs included propofol (Propofol-ratiopharm® 10mg/ml), lorazepam (Tavor® pro injectione 2mg/ml), haloperidol (Haldol®-janssen 5mg/ml), clonidinhydrochlorid (Paracefan® 0.15mg/ml), diazepam (Diazepam-ratiopharm® 10mg/2ml), and piritramid (Dipidolor® 7.5mg/ml). Intervention consisted of the implementation of an algorithm-directed sedation and pain guideline according to recent guidelines and the study by Brook et al. . Sedation and pain level as well as medication dosage were documented every 4 hours. To define depth of sedation, the Richmond-Agitation-Sedation Scale (RASS) was used . To quantify pain sensation we used a pain scale ranging from one for no pain to six for intolerable pain and evaluated vital parameters such as blood pressure, heart rate as well as patient’s mimic. Additional diseases (e.g. sepsis) or specific therapy (e.g. controlled hypothermia), which required particular depth of sedation were documented as well. The algorithm and RASS table was placed at every patient’s bed. The ‘target state’ of sedation and pain level was defined daily in the morning rounds after assessing the individual therapy plan for each patient. The ‘actual state’ was described by the patient’s actual status of RASS and pain level. Aim of the standardized sedation and pain therapy was the assimilation of ‘target and actual state’. If the ‘actual state’ differed from the ‘target state’, analgo-sedative medication was adapted according to the algorithm. The algorithm included instructions for ‘over-sedated‘ and ‘under-sedated‘ patients. ‘Over-sedated’ patients were sedated deeper (mostly RASS -3 to -5) than the defined ‘target state’. ‘Under-sedated’ patients were lightly sedated or agitated (mostly RASS +2 to +4) compared to the defined ‘target state’. Statistical analyses were performed with STATA 10.1. Kruskal-Wallis test was used to compare the distribution of MVT and LOS between standard-care, interventional- and follow-up group. Mann-Whitney-U-Test was used to compare two independent groups. All statistical tests were two-sided. P-values less than 0.05 were considered significant. The terms of the latest version of the declaration of Helsinki for Medical Research involving Human Subjects have been adhered to. The local ethic committee approved this study. Patients with emergency endotracheal intubation and effective resuscitation received information from director of study after successful weaning and extubation. The patients or relatives gave written informed consent for the study after sufficient time for consideration and information. Demographic data of our patients are demonstrated in Table 1. We found a trend towards shorter MVT after intervention and in the follow-up group compared to the standard-care group without statistical significance (Fig. 2). 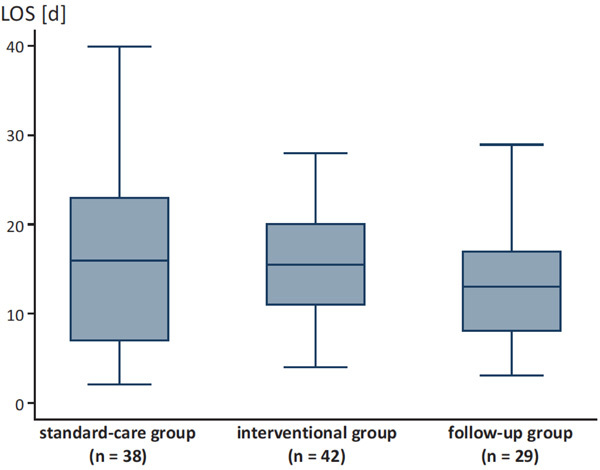 Patients of the standard-care group had a median MVT of 163.5 h ± 125.8 (range 25.0 - 451.0) compared to patients of the interventional group with a median MVT of 161.0 h ± 100.7 (range 24.0 - 372.0) and patients of the follow-up group with a median MVT of 154.0 h ± 110 (range 24.0 - 487.0; p = 0.881). Likewise, there was a trend towards lower median LOS after intervention without statistical significance (Fig. 2). Patients of the standard-care group had a median LOS of 16.0 days ± 9.1 (range 2.0-40.0), compared to the interventional group with a median LOS of 15.5 days ± 6.1 (range 4.0-28.0) and the follow-up group with a median LOS of 13.0 days ± 7.5 (range 3.0-29.0; p=0.543, Fig. 3). The use of analgesics and sedative medication is essential in critical-care therapy during mechanical ventilation [3, 14, 15]. In the present study we analysed the long-term effect of an algorithm-based sedation management in mechanically ventilated patients after sudden cardiac arrest due to STEMI. Our data revealed a trend towards shorter MVT in long-term observation 29 months after implementation of an algorithm-based sedation management. So far, there is one study that analysed the impact of sedation guidelines in patients after sudden cardiac arrest, describing a high impact on the patients’ severity of illness . Instead, there is more evidence regarding the mortality and morbidity of STEMI patients requiring mechanical ventilation. It has been demonstrated that the need for mechanical ventilation was associated with a poor prognosis and was related to death at long-term . Lesage et al. confirmed a high mortality in patients with acute myocardial infarction requiring mechanical ventilation . Furthermore, data analysing the effect of implemented sedation management are partially controversial. Brook and colleagues have shown in a randomized clinical trial with 321 patients that the use of protocol-directed sedation can reduce the duration of mechanical ventilation, the intensive care unit and hospital lengths of stay, and the need for tracheostomy among critically ill patients with acute respiratory failure . Marshall and colleagues  demonstrated that the institution of a daily pharmacist-enforced intervention directed at improving sedation guideline adherence resulted in a significant decrease in the duration of mechanical ventilation in 156 patients receiving continuous sedation. A randomized trial of Bucknall et al. provided no reduction of MVT or LOS, by the use of protocol-directed sedation compared with usual local management . Elliott and co-workers demonstrated in a pre- and post-interventional comparative study that the use of an algorithm-based sedation guideline did not reduce MVT . Diversity in sedation practises may explain adverse results of previous studies on MVT. In addition, there is a coexistence of different therapy standards in critical care with a variety of basic ICU conditions (e.g. nurse-patient ratio), of sedative and analgesic medication (e.g. lack of availability of sedative agents), this might explain the controversial effects. Furthermore, data regarding the long-term effect of implemented sedation management on MVT and LOS are lacking so far. To the best of our knowledge, this is the first study demonstrating the long-term effect of an implemented sedation guideline on MVT and ICU LOS. Many studies with this topic regard the short-term effects of an implemented sedation protocol within a 12-month period. Weisbrodt et al. have analysed the effect of daily interruption of sedation in mechanical ventilated patients within a 12-month period . Mascia et al. evaluated the cost-effectiveness and safety of rational use of guidelines analgesia and sedation in mechanical ventilated patients within an 18-month period . Since the evidence of long-term effects of implemented sedation guidelines is low, there is a need for more trials with a larger collective. Limitations of the study: Comparison of retrospective with prospective data limits the comparability of the groups with lack of randomisation. To demonstrate consistency of groups we correlated diagnosis and applied strict inclusion criteria. An undistorted prospective collection of patients’ data was not possible due to raised awareness concerning the changed sedation practises in the medical staff. In addition, denying a standardized scheme to one of the randomised groups could have been ethical questionable. Furthermore this study was performed in a single-centre setting on a special patient collective; therefore the results may not be directly applicable to other ICUs caring for different groups of critically ill patients with specific sedation practises. In conclusion, MVT and LOS are influenced by the implementation of an algorithm-based sedation management. Our data demonstrate the long-term effect of sedation guidelines after sudden cardiac arrest in STEMI-patients. Further investigations are necessary to evaluate our results in a larger collective and to identify additional factors affecting MVT and LOS. Jacobi J, Fraser GL, Coursin DB, et al. Clinical practice guidelines for the sustained use of sedatives and analgesics in the critically ill adult Crit Care Med 2002; 30(1): 119-41. Robinson BR, Mueller EW, Henson K, Branson RD, Barsoum S, Tsuei BJ. An analgesia-delirium-sedation protocol for critically ill trauma patients reduces ventilator days and hospital length of stay J Trauma 2008; 65(3): 517-26. Martin J, Heymann A, Bäsell K, et al. Evidence and consensus-based German guidelines for the management of analgesia, sedation and delirium in intensive care--short version Ger Med Sci 2010; 8: Doc02. Marshall J, Finn CA, Theodore AC. Impact of a clinical pharmacist-enforced intensive care unit sedation protocol on duration of mechanical ventilation and hospital stay Crit Care Med 2008; 36(2): 427-33. Olson DM, Zomorodi MG, James ML, et al. Exploring the impact of augmenting sedation assessment with physiologic monitors Aust Crit Care 2014; 27(3): 145-50. Chawla R, Myatra SN, Ramakrishnan N, Todi S, Kansal S, Dash SK. Current practices of mobilization, analgesia, relaxants and sedation in Indian ICUs: A survey conducted by the Indian Society of Critical Care Medicine Indian J Crit Care Med 2014; 18(9): 575-84. Mehta S, Burry L, Fischer S, et al. Canadian survey of the use of sedatives, analgesics, and neuromuscular blocking agents in critically ill patients Crit Care Med 2006; 34(2): 374-80.
 de Jong JS, Marsman RF, Henriques JP, et al. Prognosis among survivors of primary ventricular fibrillation in the percutaneous coronary intervention era Am Heart J 2009; 158(3): 467-72. Shiga T, Hagiwara N, Ogawa H, et al. Sudden cardiac death and left ventricular ejection fraction during long-term follow-up after acute myocardial infarction in the primary percutaneous coronary intervention era: results from the HIJAMI-II registry Heart 2009; 95(3): 216-20. Committee EC. 2005 American Heart Association Guidelines for Cardiopulmonary Resuscitation and Emergency Cardiovascular Care Circulation 2005; 112(24)(Suppl. ): IV1-IV203. Brook AD, Ahrens TS, Schaiff R, et al. Effect of a nursing-implemented sedation protocol on the duration of mechanical ventilation Crit Care Med 1999; 27(12): 2609-15. Martin J, Parsch A, Franck M, Wernecke KD, Fischer M, Spies C. Practice of sedation and analgesia in German intensive care units: results of a national survey Crit Care 2005; 9(2): R117-23. Sessler CN, Gosnell MS, Grap MJ, et al. The Richmond Agitation-Sedation Scale: validity and reliability in adult intensive care unit patients Am J Respir Crit Care Med 2002; 166(10): 1338-44. Kollef MH, Levy NT, Ahrens TS, Schaiff R, Prentice D, Sherman G. The use of continuous i.v. sedation is associated with prolongation of mechanical ventilation Chest 1998; 114(2): 541-8. Quenot J-P, Ladoire S, Devoucoux F, et al. Effect of a nurse-implemented sedation protocol on the incidence of ventilator-associated pneumonia Crit Care Med 2007; 35(9): 2031-6. Lazzeri C, Valente S, Chiostri M, Attanà P, Mattesini A, Gensini GF. Mechanical ventilation in the early phase of ST elevation myocardial infarction treated with mechanical revascularization Cardiol J 2013; 20(6): 612-7. Lesage A, Ramakers M, Daubin C, et al. Complicated acute myocardial infarction requiring mechanical ventilation in the intensive care unit: prognostic factors of clinical outcome in a series of 157 patients Crit Care Med 2004; 32(1): 100-5. Bucknall TK, Manias E, Presneill JJ. A randomized trial of protocol-directed sedation management for mechanical ventilation in an Australian intensive care unit Crit Care Med 2008; 36(5): 1444-50. Elliott R, McKinley S, Aitken LM, Hendrikz J. The effect of an algorithm-based sedation guideline on the duration of mechanical ventilation in an Australian intensive care unit Intensive Care Med 2006; 32(10): 1506-14. Weisbrodt L, McKinley S, Marshall AP, Cole L, Seppelt IM, Delaney A. Daily interruption of sedation in patients receiving mechanical ventilation Am J Crit Care 2011; 20(4): e90-8. Mascia MF, Koch M, Medicis JJ. Pharmacoeconomic impact of rational use guidelines on the provision of analgesia, sedation, and neuromuscular blockade in critical care Crit Care Med 2000; 28(7): 2300-6.